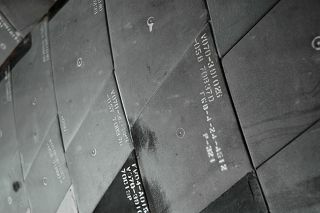 Some of the more than 20,000 tiles that protect the space shuttle during reentry into the Earth's atmosphere. NASA is offering 7,000 of the tiles to schools and universities. NASA is holding a "baked-goods" sale for schools, but instead of tasty desserts, the space agency is offering something much hotter: space shuttle heat shield tiles. NASA began Wednesday offering 7,000 of the black-and-white lightweight tiles to U.S. schools and universities that "want to share technology and a piece of space history with their students," according to a space agency statement. The tiles are free for the asking, but following the "transfer protocol" for government property, schools must cover the shipping and handling charge – a grand total of $23.40. That's quite the bargain considering that NASA estimates its original acquisition cost was $1,000 per tile. More than 20,000 tiles are installed on each space shuttle and each tile is designed to survive 100 trips to space and back. Varying in thickness from one inch (2.54 cm) to five inches (12.7 cm) depending on the heating they will be subjected to, the tiles collectively protect the orbiter from temperatures as high as 2,300 degrees Fahrenheit during its reentry into the Earth's atmosphere. The silica tile material – referred to as LI-900 or Lockheed Insulation-9 pounds per cubic foot – insulates heat so well that tiles can be held bare-handed on one side even while the opposite side is still red hot. Educators can demonstrate that ability in the classroom, substituting a blow torch for the re-entry-generated heating. NASA is fulfilling the requests for the tiles on a first-come, first-served basis. Qualifying educational institutions can apply online through the General Services Administration website at http://gsaxcess.gov/NASAWel.htm. A part of NASA's ongoing efforts to "preserve the shuttle program's history and inspire the next generation of space explorers, scientists and engineers," according to a release, the heat shield tile offer comes as the space agency is preparing to retire its orbiter fleet next year. Two more shuttle missions are scheduled, with a third pending congressional funding. The launch of the next flight, Discovery’s STS-133 mission, has been delayed to next year as NASA investigates the cause of cracked support beams on the shuttle’s external tank. Visit collectSPACE.com for continuing coverage of NASA’s efforts to share artifacts from the space shuttle program.